Wednesday, October 23, 2013 from 5-7:30 pm in the 4th floor conference room of the Salt Lake City Main Library, 210 E, 400 S., SLC, UT. See Cycling Utah's comments below. 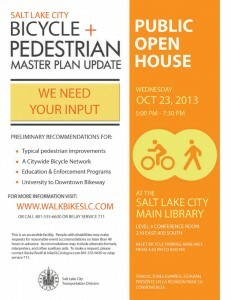 Salt Lake City will be hosting an open house to solicit comments on the upcoming Bicycle and Pedestrian Master Plan Open House on Wednesday, October 23, 2013 from 5-7:30 pm in the 4th floor conference room of the Salt Lake City Main Library, 210 E, 400 S., Salt Lake City, Utah. This is your chance to provide input on pedestrian improvements, the citywide bicycle network, education and enforcement programs, and a University of Utah to Downtown Bikeway. Submitted by Dave Iltis, Cycling Utah. October 14, 2013. General comments – The programs included are mostly on the right track, but seem like they need to be a bit better organized and categorized. There are also too few programs. See below for some needed additions following the comments on the particular programs. The time given to comment, and the development process for the list of programs was too short and too closed. This should be a high priority. Most of what SLC has done and is planning on doing is geared around transportation cycling – shorter, within the city trips to and from a destination. Recreation makes up 50% of bike trips. Shouldn’t at least some small part of SLC’s planning be geared toward recreation? It is also a great way to foster healthy communities, another underserved area. Wouldn’t it make sense to at least support 50% of the riders with a program like this, when most others are geared toward transportation? Salt Lake City has 12 bike shops. Most bikes that they sell are for recreational cyclists. Support for the efforts that they make, and the approximately $12 million (estimate) a year that they contribute to SLC’s economy is necessary. Rec Bike Routes will support these local businesses. Should this be in part an infrastructure program? The medium term cost estimate of High seems out of line and should be ‘medium’, especially when compared to other infrastructure (not encouragement) programs. The routes need to be looked at for spot improvements which would be done in the process of general bike route maintenance since most of the routes will likely be on existing or proposed bike routes, but that doesn’t mean that those costs should be fully assigned to the Rec. bike routes. It would be appropriate to include a couple of possible routes as examples, since the Cycle the City, while a great concept, is not necessarily illustrative of other rec. bike routes such as Emigration Canyon, the Jordan River Parkway, or the Great Salt Lake Route since it is a shorter, slower paced, fully urban ride. Emigration Canyon is one of the most popular rides in the city, if not the most popular (see 2011 bike count). Elevating the stature of this ride, and others like it, would serve half the cycling population at minimal relative cost. This would be a huge attraction for tourists and trade show visitors coming to SLC. This of course leads to higher tax revenues which in turn allows more bike programs to be implemented. Particularly, it would be a great thing for attracting Interbike. The partners need editing: Please add Cycling Utah (yes, we are willing to help). Please add Salt Lake County (there is great interest in SLCo from the Mayor’s office), and other bounding cities (N. Salt Lake, WVC, SSLC). Adventure Cycling is an appropriate partner, but realize that their main program is the USBRS which are more like interstates routes for bikes, not the one to multi-day routes in this proposal. Salt Lake City is on one of the proposed corridors for the USBRS. The Economic Benefits should be a check-+. Driver safety behavior should be a check-plus as well since the demarcated routes will attract more recreational cyclists and thus improve visibility for cyclists on these routes and thus improve driver behavior and overall cycling safety (on these and all routes). Iowa generates $365 million per year from bike tourism. Maine generates $66 million/year from bike tourism. Arizona – approximately $88 million. SLC would benefit from having this in place. These are already happening – SLC Bike Party, and Critical Mass. Direct mention of these should happen in the document. Add: Annual bike surveys need to be added to the program. Surveying rider behavior and interest with a standard questionnaire should be added to this in order to gauge more than just participation. Add: Crash Map – work with SLCPD, UPD, and Salt Lake County to collect data on crash locations, severity, etc. Bicycle Friendly Business Programs – some of this can be done sooner (2014). Please add Cycling Utah as a partner and I will help with some of the intitial part of this program. I have already done some of the legwork on this (in 2011). Also, why is this a high priority item? Does it have that much impact compared to something like Safe Routes to School? Both bike friendly businesses and districts should be given their own timeline. Women and Cycling – maybe add a buddy/mentor program/concept. Raise the priority of this, but don’t have SLC Transportation lead this program – leverage relationships. The Bike Collective might be better to lead this. Police Training – this should include as a partner the State of Utah Public Safety as well as UPD (Salt Lake County). SLCPD should be the primary agency, not SLC Transportation. Some of this is likely being done already with SLCPD and their police liaison to the bike community. Smart Trips – this should be expanded to include large venues and gatherings – including the Energy Solutions Arena, the LDS Conference Center, Rice Eccles Stadium, the Huntsman Center etc. Additionally, this should be expanded to include training for larger businesses, such as those at the International Center. Or the Medical Campus at the U of U. Encourage Bike to the Ballpark days for the Jazz, Bees, Utes, etc. Winter Bicycling – Need to add improvements to winter snow clearing on paved trails such as the Jordan River Parkway. This may require lobbying to change the state law on risk for communities. Wisconsin has a good model law. The plowing aspect of this should be done asap. It’s not clear why the rest of this is delayed. If staff time is low, and most of the program implementation is web resources, why wait? And, why make SLC Trans. the primary agency – move this to Sustainability and SmartTrips. Classroom Bike Training – rename to Youth (and adult?) Education. This should have a check-+ for the economic benefit, as this will result in more cyclists, which decreases gas expenditures, and thus increases local economic development. Additionally, it will lead to more bikes sold. This is a high priority item and it should be. Add Bike Rodeos to this (SLCPD as partner). Traffic Ticket Diversion Program – this is really an education program. It shouldn’t be delayed as long until 2016, but it also should be taken on by the Justice Courts, SLCPD, SLCo, SLC Prosecutor’s office, and UPD. This should not be a main program of the Trans. Division. It may also require changes in state law. Bus Driver Training – why is SLC Transportation one of the primary agencies? Just make a phone call and work with UTA and let them handle it. Then it doesn’t have to wait until 2017. This seems like overreach to expect that SLC Transportation should be a primary agency in this. Police Crosswalk Stings – Regarding funding, won’t much of this take care of itself from tickets written? Have you asked SLCPD about this? Beginning Driver Education – since this is a low cost and low staff time item, and since SLC Transportation isn’t likely to be doing any of the education, why not move this up on the priority list and get it out of the way? Better yet, find a better primary agency such as UDOT’s Road Respect Campaign, or Highway Safety, or SLCPD. Pedestrian Wayfinding – add a walking map of SLC to this. One may already exist, but add the map to this program. Additional Needed Programs – Most notably, more programs are needed for recreational cycling, and Economic Development. i. Safe Routes to School is barely mentioned – yet, this is an existing and established program. While SLC has had some coordination with the SLC School District, this is a ‘low hanging fruit’. Participation in cycling nationally by youth is declining (see recent Bicycle Retailer numbers issue). SLC work towards making conditions safer for kids to ride to school. This may be taken care of in part in the infrastructure area of the Master Plan, but it needs explicit reference in the programs section. You could rename/reorganize Classroom Education and Bike Trains to Children and Cycling. ii. Work on adding bike parking at schools. Compare and contrast Bryant Elementary and Whittier Elementary in SLC. Bryant has no bike parking other than a wheel bender rack, and typically there are 0-2 bikes in the rack. Whittier on the other hand as a bike parking corral. The other day, there were 15 or so bikes in the corral. iii. Work to develop Free Range Kids. iv. Encourage the SLC School District to participate in the Utah Cycling High School Cycling League. Develop programs to educate and involve the participating kids in commuting and recreational cycling. Currently, not all SLC high schools participate. Recreation – other than the recreational bike route program, and arguably the monthly social rides, there is little mention of recreation in the plan. This is a huge oversight as recreational riders become commuters and vice-versa. Mention or include bike parks/pump tracks in the plan. Racing and Century Rides – Develop a program for increasing improving bicycle racing and bicycle touring event (century rides). This could include streamlining and improving the permitting process and reducing costs for events like this. Century rides are how many people become comfortable with recreational riding. SLC needs to support this. Racing – Actively seek out national level cycling events. Salt Lake City hosted the US Elite Amateur Road Race Championships in 1991. SLC, particularly Economic Development should work towards this again. Ogden is currently working full bore on stuff like this. SLC should be too. Events like this bring hundreds of visitors to SLC who spend money and thus increase tax revenues for the city. They also serve to encourage kids to ride more by providing cool role models. Bike Parks – Develop more fully the Bike Park concept to include not just dirt jumps, but also mtb trails or trail systems, road, and track cycling programs. See for example the Eagle Bike Park in Boise. SLC used to be a world mecca for track racing in the early 1900’s, and in fact this is what the Salt Palace was built for. Additionally, see what Draper City is doing. Trails Master Plan – while the Bike/Ped Master Plan is more focused on biking on the roads, SLC has great potential for improved trails – both off-road paved trails, and off-road dirt mountain bike trails. It is a hugely needed plan for SLC. While the actual plan probably doesn’t belong in the Bike/Ped master plan, the concept and call for this does need to be included as a necessary adjunct program. Recreational mountain biking is how many people get started in cycling. They eventually may become recreational cyclists or commuters through this entry point. Bicycle Wayfinding – this is a much-needed program and would parallel the already included Pedestrian wayfinding. The signage would allow people to find their way without a map. Continuation of the ‘Look’ pavement signs for pedestrians. In my experience, this is a highly effective program, as are the crosswalk flags. Anti-bike theft program – Bike theft is a huge problem in SLC, yet if often appears as if not much effort is being put in to preventing theft. Police stings, how to lock a bike, and better bike parking throughout the city (especially since the introduction of the blue electronic parking meters) are all needed. Low income programs – Partner with Housing advocates, shelters, the Bike Collective, and Low income advocates to make cycling a transportation alternative for low income residents. i. Low Cost Bike Share for participants in jobs programs would be a good place to start. See Washington DC for an example. i. Apartments – require bike storage – see NYC. ii. Office Buildings – require better bike parking, shower facilities, etc. iii. Curb cuts, especially for driveways – require that they be smooth, rather than with a 1” lip. iv. Better bike parking ordinance (although this may be addressed in the current TDM and parking rewrite before the city council). Economic Development – this is a huge omission from the plan, other than local effects in neighborhoods. Salt Lake City is positioned perfectly in the West to be a hub for bicycling business, bike companies, tour companies, etc. We have a great location for shipping to the entire west, as well as nearby accessibility for great recreational riding – both road and mountain, and we have a great University that can supply engineers, physiologistst, etc. Yet, SLC has few if any programs for recruiting bike businesses to relocate, or to foster local bike businesses. This would be a program for Economic Development, rather than Transportation. i. Ogden is doing a great job with recruiting bike businesses. See what they are doing for more information. SLC needs to keep up. iii. Interbike – Additionally, SLC needs to figure out what is needed to bring Interbike to SLC. Efforts are happening through SLCo, and SLCVB, but SLC needs to take part as well. Interbike would have an incredibly positive effect on cycling in SLC, not only through increased cyclists visiting SLC, but by the bike companies that would relocate to SLC to take advantage of our great outdoors amenities. iv. National Handmade Bicycle Show – This should be a priority for SLC. Partner – SLCVB. v. Events – as mentioned above, events (races and tours) are an important economic driver as well as serving to increase the number of people riding for recreation, health, and commuting. Improving conditions, costs, permitting for events is needed. Currently, costs are too high. vi. Bike Friendliness as an amenity – this needs to be part of the pitch for economic development – SLC is a bike friendly city for both recreation and transportation. Goat Head Mitigation Program – this is perhaps the biggest threat to our paved trail system. We spend millions on constructing the trail, but little to nothing on controlling this noxious weed. This needs to be implemented before the PRATT trail connects with the JRT, and before the 200 S and N. Temple section of the JRT is completed since the completion of these will open up vectors for transmitting seeds throughout the PRATT trail, and the Legacy Trail and render those multi-million dollar systems crippled for part of the year. Bike parking program – a long term funding stream and planning effort needs to be implemented to mitigate the loss of 4400 bike parking places when the parking meters were removed. The current effort is a start, but not a solution. i. Bike Rack Donation Program – Implement where businesses can donate bike racks to the public right of way (and that would have the name of the donating party attached to the rack). See Montrose Colorado: http://www.montrosedowntown.com/DocumentCenter/Home/View/122 for an example. ii. Divert a portion of revenue collected from parking to bike programs, particularly bike parking. Bike/Ped Staff – With all of the programs, planning, new bike routes, etc., and the current state of the Transportation Division, it seems that it will be necessary to hire additional staff in the Bicycle and Pedestrian Program. If we want to move forward as a cycling city, this is a necessary expenditure, as there are not enough staff people (even though they are doing great work) currently to accomplish all of the great things in this plan. Bike Route eyes and ears program – currently, there are many details missing from many of SLC’s bike routes including missing signs, missing paint at intersections, potholes, unsafe railroad crossings, bad signals, etc. Adding a program and mobile reporting to the SLC 311 app would help solve this issue. Bridges (this is really an infrastructure program, not encouragement, but it needs to be mentioned) – work with UDOT to make the bridges over I-15 safer. 2 Responses to "Salt Lake City to Host Open House for Upcoming Bicycle and Pedestrian Master Plan on October 23, 2013"